The Circus Smirkus tour is circulating through New England this summer with an excellent show. The performers are kids up through high school age, and they are fabulously talented. One young man does incredible things with his unicycle, there is a pair of girls that do a very nice act on trapeze, some very interesting other aerial acts, and excellent clowning. This is a one-ring circus that your kids can sit right up by the ring and watch! There is still a chance to see the show in southern Maine, Cape Cod, and Vermont! You can find the schedule here. Here is a story about one of the troupers, Maddy Hall, from Washington DC. Tickets are available on-line or locally. Go and have fun! This is a shameless plug for a great cause. 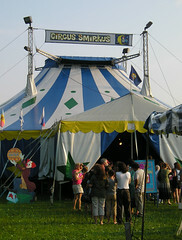 Circus Smirkus is a youth circus school and tour located in Northern Vermont. Every summer there are camps for kids of varying ages and skills at a wonderful hilltop spot near Greensboro, Vermont. Many of the kids going to the camp aspire to join the big top tour that Circus Smirkus puts on during the summer, where incredibly talented kids up through high school age perform a number of times a week for crowds throughout New England and also do charity shows. Some kids go on to work professionally in the circus or to advanced circus schools. Circus Smirkus not only benefits the kids, but the big-top performances are sponsored by local groups who are able to collect the revenues from ticket sales above the Circus Smirkus per show cost. It is a win-win proposition. Photos here and here. And here is a nice, recent article in the Christian Science Monitor (check out the slideshow). Folks, The Sapling would like to be on the tour, but that isn't going to happen if Circus Smirkus can't raise some money to pay off accumulated debt. The Sapling is a talented juggler (among other things), and also would like to develop his "partner-acro" skills. In addition, the Bunny Rabbit would really be sad if she can't go back to Smirkus camp next summer! If the Smirkus tour doesn't happen our CSA farm will miss the revenues that we have used to slowly but surely improve our farm buildings and equipment. Finally, all those people around New England who look forward to seeing the Smirkus big top show each summer will certainly lose something too. So, go to the Smirkus website, and please help us all out!!! There is a matching grant, so your $25 will really be $50 -- there aren't too many places that your money doubles that fast!